I got this Elmo for Serenity after seeing how much she enjoyed watching Elmo’s World. She loved him right away and hugged him tight while watching Elmo on TV. I guess he doesn’t really have much educational value, other than the fact she recognizes him from Sesame Street. But she does play pretend with him and talks to him, so I would say that the imagination value is equal to the educational value. Gund makes the best plush animals, and we have several from Sesame Street. I’ll be adding more to Serenity’s collection when I get the chance. Right now we have Big Bird, Abby Cadabby, Zoe Ballerina, Grover, and of course Elmo! All of them are wonderfully detailed, soft and perfectly cuddly for toddlers. Big Bird and Grover are the “new larger size” like Elmo. I would definitely recommend this Elmo for toddlers. Toddlers need that perfect friend who will cuddle and listen while they talk and to go on fantastic imaginable adventures! 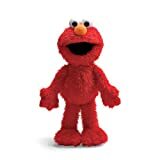 my daughter loves elmo, so when she outgrew her 13in elmo and was discouraged by the loud, hard, and not sleep friendly elmo toys that she already had. so after a few restless nights we got her this and she hasnt been happier. ITS PERFECT. no noise, just soft lovable and the perfect toddler size to go everywhere. in the car, to bed, to play, on a walk he never leaves her side. we look forward to adding more sesame street characters to her collection as well. This elmo is much bigger than the 13 inch gund elmo. The 13 inch one I thought was very small. This one is just right in size for my 14 month old daughter. She loves it. It isn’t as soft as the 13 inch one, but it’s very cute! His fur doesn’t look like the fur in the picture.